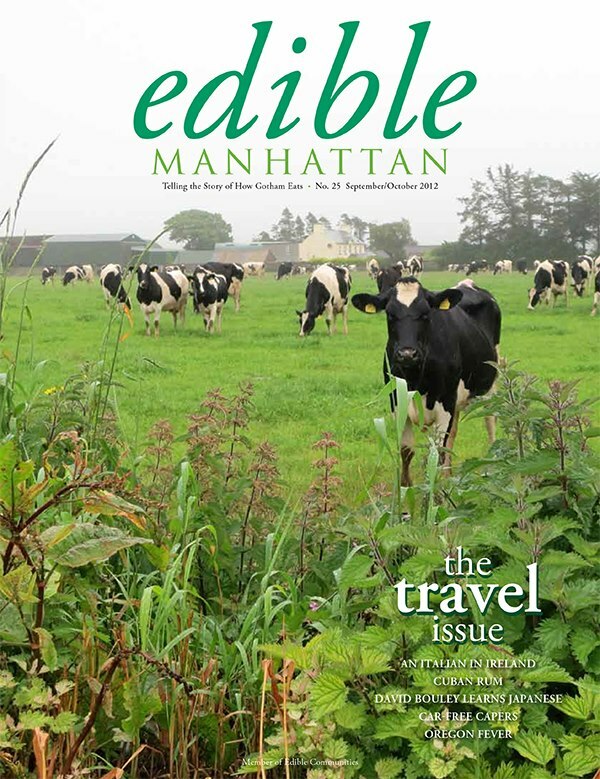 For a magazine whose locavore roots go deep, Edible Manhattan gets around in their Fall travel issue. Rachel Wharton heads to Dublin to chat with Manhattan chef Patti Jackson during her “Exile in the Emerald Isle” . Thankfully, a recipe for the Irish brown soda bread they sampled – “sweet, dense, nourishing, heavy; the middle moist; the outside cracked and craggy” – is included so I’ll be taking my own virtual trip this weekend. In a “A Locavore in Barbados”, Karen Karp gives a fish market-shark oil stall-maubey bark-Blackbelly sheep view of Barbados that will keep you dreaming until you can see it for yourself. Traveling in time as well as space, they even get in a quick trip to Prohibition-era Havana which was proudly not dry. Closer to home, Andrea Strong writes about the International Rescue Committee‘s New Roots program, a network of urban farms for refugees, in “Field of Dreams: In Gardens, Refugees Put Down Roots” and Marie Viljoen of 66 Square Feet will keep you looking for autumn-olives. My own contribution started this summer when I was doing a round-up for the Puerto Rican Day parade. A friend directed me to Cuchifritos on 116th street which had become a point of return for people who’d moved away from East Harlem. Several alcapurias, pasteles, and giant tamarind juices later, I had my “East Side Story” and was reminded that, in New York, you don’t have to go far to feel that you’ve been somewhere.